Are You Really Planning to Bring Back those Animal Sacrifices? Question: Please explain all this business about animal sacrifices in the Temple. Are you really planning to re-initiate this at some point? Answer: Cain and Abel made vegetable and animal sacrifices. Noah made animal sacrifices. Abraham, Isaac and Jacob—all highly enlightened people—made animal sacrifices. And the Torah prescribes a whole slew of sacrifices to be made in the Tabernacle in the desert, and then later in the Holy Temple in Jerusalem. And guess what? In our prayers, for the past 2,000 years, weve been asking for G‑d to let us rebuild that Temple so that we can start doing those sacrifices, just like He asked us to. So there’s got to be something deep going on here, more than meets the eye. Q: But the whole thing doesn’t make sense! Charity, prayer, study . . . all those I can understand. But why on earth would G‑d want us to burn animals on an altar? A: Now, don’t get the idea that you’re the first one to have difficulty with this. It puzzled the students of Maimonides in the 12th century. It puzzled the students of the rabbis of the Talmud. In the Zohar it’s written that the secret of the sacrifices reaches to the secret of the infinite. It’s one of those things that if it doesn’t puzzle you, you just haven’t gotten the facts straight. I think we need to look at this from a very different perspective to make sense of it. Q: It all looks like just a holdover from pagan rites. A: It’s clear that there are some major distinctions between the sacrificial order of the Torah and your typical ancient-world pagan rites. For one thing, the rules and regulations were spelled out right there for all to read. In fact, every Jew has an obligation to study the details of the Temple rites. Even little children are supposed to learn everything those priests are to be doing. That’s a far cry from the cult of secrecy that empowered the priestly class of other nations. There were some other major distinctions: The Temple was considered the property of the people, and daily communal sacrifices reinforced that fact. There were no male or female prostitutes wandering around the courtyards, no orgies or drunken revelry—or self-mutilation. The priests wore modest, standardized clothes, and were held accountable by a people’s court that sat right there at the edge of the Temple complex. Most of the meat was eaten—a lot less waste than what goes on at Safeway or Stop & Shop. And animals were slaughtered in a humane fashion. Definitely a sublime relief from ancient standards. All in all, it must have seemed a very strange place for the average Joe Ancient. Q: But not to our standards today. If the whole point was to wean the people off sacrificial cultism, then it was good for then. But why should we be praying for it to return? Sure, it’s cool to have a central place for prayer and meditation, with the menorah, the incense, the tablets that Moses brought . . . but why the butcher shop? A: The main act of a sacrifice was not the physical act of slaughtering an animal. You understand that the sacrificial service was principally a spiritual one. A: Well, for one thing, when a person brought a sacrifice, his mental focus was crucial. If his mind was not focused on the correct meaning and intent of the sacrifice, the whole thing could be deemed useless, or worse. Q: What sort of meanings? A: Well, if it was being brought to atone for some inadvertent sin, he had to have in mind some remorse over what had happened. But it went far beyond that: The priests would focus their minds on the higher spiritual spheres, according to esoteric traditions. That explains why they had the Levites singing and the musicians playing. After all, if it was all just a grand barbecue, what need was there for inspirational music? Rather, it was a deep spiritual experience for all involved. You went away truly elevated. Q: Okay, I can see the experiential quality of it all: an ancient temple with heavenly music and mystical song; priests in flowing robes deep in meditation; mesmerizing, choreographed ritual. It’s an image I hadn’t realized before. Q: But I think we could get the elevation without the blood and guts. A: Well, in fact, today our prayers are in place of the sacrifices. So the principal aspect of the sacrifices was never terminated. Just the outer aspects that the Torah also demands, those are temporarily suspended. Q: So, if we can have the spiritual experience without dicing meat on the altar, why go back to it? A: So we need to come to a deeper understanding of what the sacrifices and the Temple are all about. Q: If you have an explanation, I’m open. A: Well, perhaps our problem is that we are looking at it from a flat perspective. A: I mean, like trying to understand a multidimensional process from only one dimension. A: Here’s an analogy: Let’s say you never heard of a telephone, and you’re watching someone walking along the street in an intense conversation. Except that there doesn’t appear to be any second party to this conversation. In fact, he appears to be deeply engaged in an argument with . . . his wrist. Q: Because his hand is cupped to his ear? A: Yes. And he’s nodding his head, waving his other arm. Then shouting. Then quiet. Then laughing, and suddenly quiet again . . .
A: But people do it all the time. Q: Okay, but it makes sense because we know there’s someone else on the other end. A: The other end of what? A: That looks even more preposterous. Where exactly is that someone hanging from? Q: You know what I mean. There’s a mobile phone network. There are signals traveling through the air. Q: We can’t see all those things, but it connects people over large distances. It’s only our ignorance of those signals and that network and all the sophisticated technology behind it that makes this guy look silly. A: Exactly. And that’s the same problem we have with sacrifices. We have to realize there’s a whole other dimension here that we don’t see. From that dimension, everything makes sense. Q: Whose dimension is that? A: Well, there are higher planes of reality than our own. Spiritual realms. And beyond. There’s a whole chain of worlds working down from the plane of the infinite light until arriving at us and our little physical cosmos down here. A: It’s in the Talmud, too—lots of details in tractate Chagigah about the seven heavens, etc. Q: So, with sacrifices . . .
A: Rabbi Isaac Luria, the Arizal, explains that the sacrifices were a way of elevating the matter and vitality of this world up to a higher plane. Q: You know, I read a story about some tzaddik who would meditate and carry his consciousness up to higher places. A: Actually, anytime someone meditates and prays with focus, he or she is doing that, to some small degree. Q: So we’re back to square one: Who needs the barbecue? A: Because that elevates only the human soul. The human soul has many layers. The G‑dly. The rational. The animal within. The sacrifices in the Temple elevated those, plus a whole real animal. It touched not just the spirit, but the body as well. Q: So the animal became holy? A: Thereby having a general effect on all the animals in the world—plus the flour and wine that was used with it, which pulled along all the vegetable world; plus the salt and water, which pulled the inanimate realm along with it . . .
Q: Let me get this straight: you’re saying that what prayer accomplishes on a spiritual level, the sacrifices accomplished with the physical world? You’re saying that the Temple was a sort of transformer, to beam up physical stuff into the spiritual realms? A: You’re getting it. That’s why the space of the Temple was so important. You know that there is a tradition that the place where the altar of the Temple stood, that was the place from which Adam was formed. Cain and Abel made their sacrifices there. Noah made his sacrifices there after the flood. The binding of Isaac took place there . . .
Q: So, why did they all have to use that spot? What’s so special about it? Q: Hmmm. You mean like what we call in ’Net jargon a portal. A: Right. Or a transformer. The interface between the physical and the spiritual. That’s what the rabbis mean when they say that when G‑d went about creating this world, the place he started from was the place of the Temple Mount. So, you’ll say, there was no space when G‑d started creating the world. But what they mean is that this is the first link from the higher worlds to this world. Thats where “above” stops and “below” begins. Heaven to Earth. And so, that’s where the transmission line between the two is situated. The portal. Q: What happens when all this meat and wine gets up there? A: Obviously, it’s no longer a chewy steak when it’s in a spiritual domain. But we are physical beings, so we can’t really imagine what spiritual roast beef looks like. But there are conscious beings that have no physical bodies, and they are on the receiving end of all this. A: That’s what they’re called in English. Q: I find it hard to relate to the angel thing. I know there are plenty of references to them in the Bible and rabbinical literature . . .
A: Ramban (Nachmanides) says that our souls are more closely related to the angels than to the animals. After all, human beings live principally in a world of ideas and abstractions, more so than in the visceral, tangible world. Q: Depends who you’re speaking about, rabbi. A: At any rate, there is no reason not to believe that there is consciousness that is not associated with a physical body. And if we would ask one of those conscious beings whether the Temple sacrifices make sense to him/her/it, it/she/he would likely exclaim that it is one of the few things human beings do that make any sense at all! And I bet they’re real peeved that it’s been stopped all these years. Q: What do they get out of it? A: According to the Kabbalah, returning energy. Q: You mean, like energy bouncing back? What do they need that for? Don’t they get enough when it’s on its way down? A: Because the energy they get is only direct energy, filtered down through many steps. We get the final, most condensed creative energy to sustain our existence in this world. But, since we are the final stop, we also have the essence of that energy. That’s something they can get only when we elevate matters of our world up to theirs. Q: You’re telling me those angels have a real interest in our sacrifices? A: They have a real interest in anything good we do. Any mitzvah we do elevates some aspect of the material world—perhaps not to such an extent as the sacrifices. But the sacrifices provide a paradigm to understand what all mitzvahs are really about. Q: So are these bodiless conscious beings involved in that as well? A: Without them, not a single mitzvah would ever get done. The Talmud says that whenever a person does a mitzvah, it is only after the Holy One sends His angels to set everything up for him to do it. And they complete the job, as well. Often, our entire input is no more than making the conscious decision that yes, I want to do this mitzvah. Q: So really, all of our mitzvahs happen within this larger, multidimensional context. A: Which is why so many of them are so hard to understand. Like trying to make sense of a single instrument playing its part out of a whole symphony. That’s what each of our mitzvahs is like. Because we see only the material plane. Why Haven't Jews Rebuilt the Temple Yet? Please discuss in context of Isaiah 1:11. Ari, we are human beings. We change. But Torah is G-d's desire, and G-d is beyond change. Out of this desire, all of time and every event it contains emerges. The entire article, had it been read thoroughly (especially if including the various links sprawled throughout) should have provided enough of an insight as to the deep significance of animal sacrifices, and why they're really not all that bad. Moderated Argument I'm sure you didn't mean it that way, but implying that I didn't read the article comes off as rude. There is no polite way to add "had it been read" to your response. Also, I didn't specifically deny any of the claims; I did, however, read them. Further, if you search for Jewish vegetarian faq sacrifice, you'll see that this article does not address those objections. Herod had removed Ezra's Temple, stone by stone, right down to the ground. He had removed the foundations and built an entirely new temple of his own. He had enlarged the Azora which was forbidden by Halacha without a Sanhedrin of 71 Judges, a Jewish King and the Urim and Tumim.He wasn't even Jewish and had murdered all the members of the Sanhedrin. The Mizbeyach had been drawn to the south out of alignment with the Sanctuary which had resulted in a misalignment between God's Knowledge and man's knowledge. Wasn't this the abomination of desolation Daniel talks about in his book? We all have to make sacrifices for the greater good and for our own long-term benefit. You drive your kids to school even when you don't feel well. You exercise even when your whole body resists your couch-exodus. You stop and hear out that homeless person you pass every day. You buy them food even though it makes you late to work, again. You give up your position in an argument for the sake of peace. You apologize to your spouse even when you weren't at fault, for the sake of the bigger picture. The purpose of the animal sacrifice is to feed everybody. I'm sure in the Age of Moshiach there will be a vegetarian option. From a legal perspective a law, divine or secular needs to be satisfied through (a) Full 100% obedience or (b) by some legal fine/punishment if it is not obeyed fully 100%. The traffic light: Red means stop. In order for this law to be fulfilled you have to stop when the light turns red. If you move on and transgress it, the only way you will satisfy this law will be by paying a fine/sanction. The law of a land is given out of interest to all citizens that they should get along; a sort of give-and-take compromise. Thus, the fines are there to ensure participation, but not really because of anyone's personal involvement with the lives of those who are punished. That's the problem I have with what you're suggesting: in G-d's world, you have to conclude that He takes a personal interest in His creations (especially if anyone is going to use the "killing G-d's creations" argument in regards to sacrifices). And thus, telling us to sacrifice animals just as a fine for something we did didn't really add up; surely, as the article attempts to enlighten us, there must be a very real and personal necessity in regards to the sacrifices which G-d requests of us to perform. Animal Sacrifice or Cruelty ? Why does Hashem design a system in which an animal(that contains no free will) has to atone for the sins of humans? In this week's parasha Acharei (the Torah portion that is normally read on Yom Kippur) The Scapegoat rite is described and basically a goat is lead into the wilderness and is thrown off a steep cliff! In order to atone for the sins of the Jewish people. This unconscionable act is a method of atonement? Wouldn't this make you more of a sinner due to the fact that you are being cruel to Hashem's creation. That's what the entire article is attempting to explain! That teshuva and other spiritual tasks remain in the realm of our thoughts, emotions, and--well, the world of the soul, basically. And to emphasize, there are many other types of sacrifices besides sin offerings, including voluntary ones. Therefore you have to conclude that there is more to it than attonement! Furthermore, the Cohen Gadol—High Priest—was known to be the most compassionate of people! And the Torah's many laws have a clearly identifiable motif of kindness and mercy. Animal Soul vs. Human Soul Homosapiens have both an animal soul and an 'angelic' 'divine' soul. But other animals, animals other than humans only have animal souls without the human/'divine' soul. There is no moral equivalence between eating an animal and eating a human Professor Martin. You know so intuitively. And, if you believe that there is no such thing as a transcendental aspect of existence, such as what is called a 'soul' in living creatures, although Judaism specifies that there are different types of souls for humans as opposed to other animals, than you are spiritually and philosophically lost. The 'animal sacrifice' according to archaeologists was for the purpose of a gigantic massive barbecue. The ancient texts even describe an old fashioned barbecue sauce made out of wine, and carefully making sure that the animals' blood was 'sprinkled' at the 'base of the alter' preventing any blood from getting into the actual food. We all know that one of the fundamental tenets of Judaism is respect for all life. If every being is divinely ordained then all of lite is sacred, especially so that mercurial creature who is in fact made in the Infinite One's image, a creative creation. We are both light and dark, selfish and altruistic, and accepting the unassailable dignity of fellow man requires us to live with contradiction. To declare an entire way of life "barbaric", especially one so committed to charity, from one piece of evidence is lazy reasoning and intellectually dishonest. Yes-we all make generalizations, but as a wise man once said: "Only the Sith deal in absolutes". Barbecue of the Future, Kosher Lollapalooza "For your own desire' because the Israelites would bring their best animals to Jerusalem from all over ancient Israel, after the priests would slaughter the animal, the families that brought the animal would eat of the 'sacrifices'. In the future, there is a massive kosher barbecue, the ancient texts even describe the ancient 'barbecue' sauce as consisting of wine and other ingredients, when all Jewish people worldwide make aliyah to Israel all at once for the sake of freedom of thought for all Jews worldwide. Yes, there will be vegetarian options for the olim who do not eat meat! In orchestrating such a massive party-in-the-streets event, keep in mind that the Woodstock festival brought at least 100,000 teenagers from all over the country to upstate New York; the problems in that event were unforeseeable bad weather, and CIA interference. 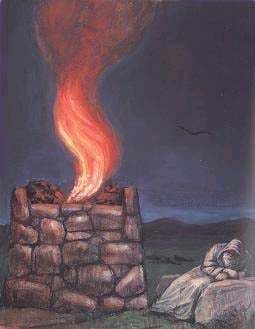 todah rabah Rabi Tzvi, parshat Vayikrah is due And the priest shall burn it on the Altar; it is food... to G-d (3:11)Do you think that He needs to eat? Does not the verse (Psalms 50:12-13) proclaim, "Should I hunger, I would not tell you, for the world, and all it contains, is Mine... Do I eat the flesh of bulls, or drink the blood of goats?" But it is not for My desire that you are offering, [says G-d,] but for your own, as it is written (Leviticus 19:5), "For your own desire, you should offer it." When the Torah refers to the korbanot as "G-d's bread," this is obviously a metaphor; but what is its significance? In what sense are we "feeding" G-d when we offer up to Him ourselves and our material resources in the quest to serve Him?Our sages have said that "G-d fills the world as a soul fills a body." On the human level, food is what sustains "life," which is the assertion of the soul's powers via its physical vessel, the body. And so it is with the divine life-force that suffuses the created existence: "G-d's food" is what we would call whatever it is that asserts the divine reality as a manifest presence in our physical world.With our every act of serving G-d, we fulfill the divine purpose of creation--that "there be for Him a dwelling in the physical realms." We thus breathe life into the world-body, asserting and manifesting its quintessence and soul. There is no moral equivalence between an animal's life and a human's life In Judaism, the 'animal sacrifics' is just a massive kosher barbecue party, the priests and masses get their food this way. In ancient times, everybody in Zion would make a pilgrimage to Jerusalem, bringing their best animals to be slaughtered and the bringers of the animals would eat the animal at Seder. Part of the purpose of the specific method of sloughier, slitting the throat, is to completely separate blood from food; that is why blood is put at the base of the altar. Every person has two components of the soul (animal and angelic/human); there is no point in arguing with anti-semites who do not want a giant kosher festival party in which animals are 'sacrificed' i.e. eaten by the priests and by the masses. Better than sacrifice ... is for Man to continue to murder/kill Man.